The banana is a berry that comes from what most people refer to as a banana tree, but is in fact a herbaceous plant or an herb. Banana trees grow best in warm climates, however they can be grown in cooler climates as well, depending on the type of tree chosen. Bananas can be used in many different dishes and recipes, which makes them one of the most popular fruits (or berries) in the world, and for some cultures, a main staple of their diet. Bananas were first recognized as an edible fruit in the Southeastern part of Asia as far back as 5000 BCE. 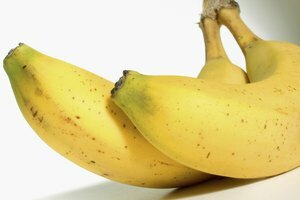 The banana made it to Europe via Portuguese sailors in the 16th century and later made it's way to what is now the United States. It was not until the 20th century that bananas became a major commodity of South and Central America, and a popular import of the United States. Bananas serve many purposes, as they are a very versatile fruit. Banana sap is used for medicinal purposes in some areas of the world. They are known for the energy boost and potassium increase that can take place through consumption. Bananas contain sucrose, fructose and glucose, and as well as fiber and a handful of minerals and vitamins. As a food they are consumed fresh, dried as a chip, ground in to flour and cooked by either grilling, frying or baking. 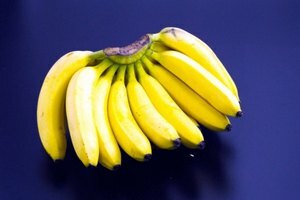 Bananas are also used in popular dishes such as banana bread, banana cream pie, banana splits and banana pudding. Bananas have long been used in comedy pieces, for example in physical comedy as the infamous slippery banana peel. They are also widely known as the fruit of choice for monkeys and apes and this is often displayed in media and cartoons. For many parents of young children, the banana is a convenient and safe fruit to serve to babies and toddlers because it is easy to hold and chew. 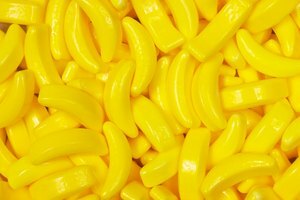 There are a variety of different types of bananas including Manzanon, baby, red and Cavendish bananas. Manzanons are smaller bananas that are usually dark in color, often black. The baby bananas are the smallest and are usually sold in large bunches. Red bananas contain a high amount of beta carotene, and as the name states, they have a red peel and a light red fruit inside. The Cavendish is the most popular banana in the United States and is the typical banana that we consume. Bananas grow in warm, tropical climates, such as South America, Africa, India and the Caribbean. Some varieties of bananas are native to certain areas of the world, for example, plantains are native to India. 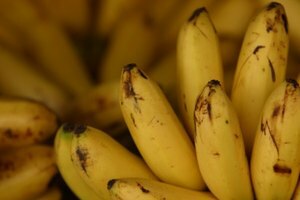 The only states in the US to grow bananas are Hawaii and Florida, however the crops tend to be small, leaving the US dependent on imported bananas. Desi Crall has a B.A. in Political Science from California State University Sacramento, and is currently a graduate student of Elementary Education at the University of Phoenix. Desi has worked as a freelance writer for three years, with articles and blogs appearing on sites such as Examiner.com, Today.com, and BrightHub.com.